Heritage Propane Express is a full service provider of propane grill cylinders for exchange for retailers and/or distributors and is based in Tulsa, Okla. Penmac recently began serving one of its offices in Marshfield, Mo., and currently 20 Penmac associates are placed there. Maintenance Project Director at Heritage Propane Express, Abe Sherwood, said that his company started working with Penmac because there is a Penmac branch office located in Marshfield. Having Penmac as the one place for job seekers to be screened and apply for work saves Heritage Propane Express the time and effort of processing their own applications. “Over the past few years many manufacturers in the Marshfield area have relocated. 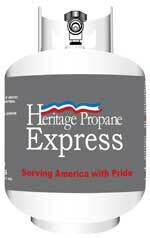 The opportunity to work with Heritage Propane Express is exciting for our office and community because they have so much potential for job growth. Their employee-friendly environment makes for a wonderful atmosphere,” said Marshfield Branch Manager Brandy Willis.